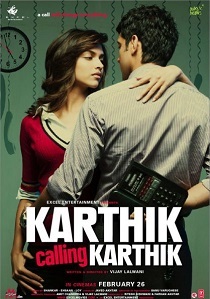 Review Summary: KARTHIK CALLING KARTHIK is a decent product with an unconvincing conclusion. Beautifully textured and constructed, Karthik calling Karthik takes us breath-close to the central character, whom his new boss calls `a strange fellow`. The idea of a mystical assistance to succeed through life's inevitable disappointments is quite a fascinating one. KARTHIK CALLING KARTHIK is a decent product with an unconvincing conclusion. The movie then gradually builds up a suspense and becomes intriguing, only to lose it all, just as the audience had resorted to nail biting!Farhan Akhtar plays Karthik and Karthik and is the underdog. Karthik Calling Karthik is half baked with hardly two scenes sending a cold shiver down your spine. The thrill is less while love and comedy seem to be forced. KCK will work in the cities more than anywhere else because such films cater to a niche group of people who will understand and even appreciate such cinema. Watch it for Farhan and Uff! 'Karthik Calling Karthik' is a movie that one can admire without exactly embracing it.